I've been watching Martha Stewart's TV Show for quite some time and she really does inspire me! Her show is great because it simplifies ideas, and uses stuff that's actually easy to get a hold of. I just browsed Martha Stewart online store and I found her flower-arranging secrets. Well, there's also a Martha Stewart bouquet for every occasion. Now, her company has produced a line of flower arrangements available through florists nationwide. One of the most innovative aspects of these floral arrangements is the vases and containers used to hold the flowers. This collection offers unique container options like pails and beautiful, modern vases. These containers are so simple, yet amazing and could be used in a variety of different ways after the flowers are gone. 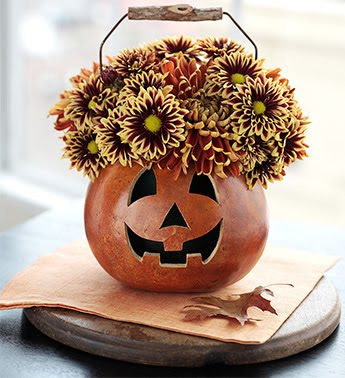 This bewitching bouquet is all treat, no trick for Halloween or any occasion. Bronze 'Football' mums and rust-yellow spray mums pair with our whimsical Carved Pumpkin Gourd, a gift straight from the pumpkin patch. 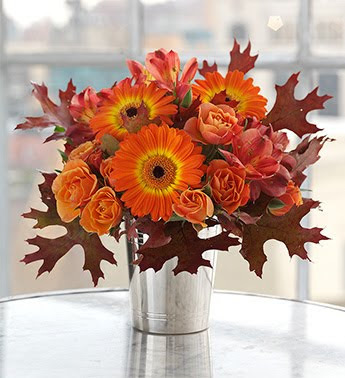 The vibrant colors of orange and yellow mix with the burnished hues of harvest in Martha's sun-spiced fall bouquet. Brilliant orange Gerbera daisies are paired with spray roses and oak leaves to create a seasonal bouquet, perfect as a centerpiece, or to remember someone's fall birthday in the glorious, color-filled spirit of the time. Nothing brings light, life and joy into the home like a beautiful bouquet of flowers. 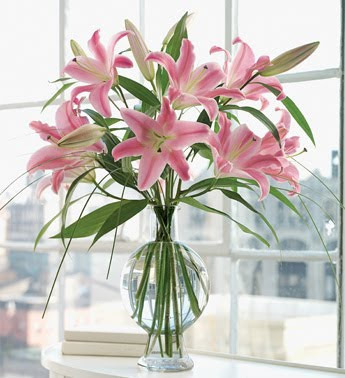 And who better to offer floral arrangements than the home-decorating diva, Martha Stewart? I was feeling sleepy just now wanted to sleep edi then got buzz buzz ha ha! I watched the video edi Mon, hehehe…. I didn know can have 5 boxes, tot 3 was standard, cool! Yeah first chop only huhuhu, oh and just now oso so 2 chops edi hahahah ooops I mean shhhhhhh! oh u didnt know she was Miss Singapore huh :-D LOL @ red, loud and booms! I didn know he he, the booms part the most obvious la , I sat up and rewind to listen properly hahahahahha! Happy Monday Mon and Happy belated mooncake festival! i haven't seen her shows in ages. i love the last flower arrangement. it's a lovely centerpiece.